The Tiger Inn is the perfect place to drop in for breakfast , whether as preparation for a brisk morning walk over the South Downs or as a well-earned reward after a walk or cycle ride. Situated in East Dean on the coast road just outside Eastbourne and en route to Lewes and Brighton, it is also ideally placed as a stopping off point on the way to work, an appointment or a shopping trip. Breakfast is served daily 8.00 – 10.00am and costs £9.95. 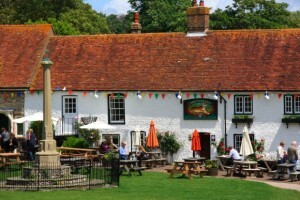 It includes a selection of toast and cereal, followed by a full cooked breakfast “The Tiger Inn’s Sussex Breakfast”. Alternatively guests can choose either spinach and poached eggs on toast with optional bacon, or scrambled eggs and smoked salmon on toast. Breakfast is accompanied by a choice of tea, coffee and orange juice. Dating back to the 15th Century and recently refurbished to a high standard, The Tiger is a quintessentially English pub, serving delicious British food and beer in comfortable surroundings. Its warm and cosy atmosphere is popular with locals and visitors alike. Lunch and dinner are also served daily with a menu offering British classics cooked to perfection. Beers on offer include ales from the nearby Beachy Head Brewery, including the award-winning Legless Rambler. The Tiger has four luxurious double bedrooms and one twin bedroom. All have en-suite bath or shower rooms. Prices start from £110 per night per room including breakfast.